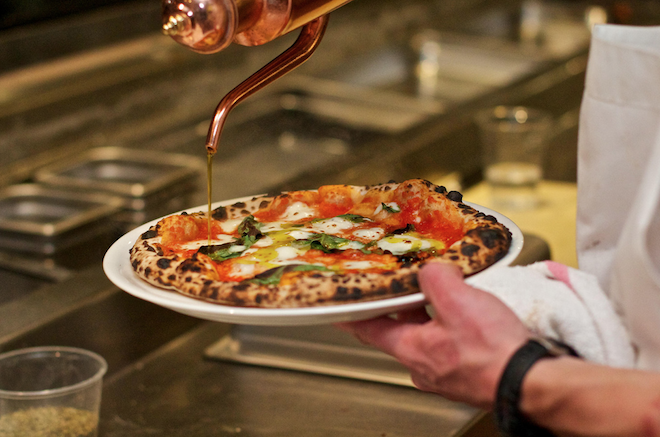 True pizza Napoletana is no slice of pie. In “Life of Pie,” a pizza feature in our October issue (on newsstands now!) author David Hochman delves deep into the world of pizza Napoletana with local pizzaiolo Peppe Miele as his muse. Since you can no longer purchase Miele’s delicate pies—his Marina del Rey-based Antica Pizzeria closed in 2011—here’s a guide on where to get the ingredients for a serious home experiment. Stay tuned: we’ll be sharing a recipe for Neapolitan-style pizza that you can make at home next week. FLOUR | The best home bakers know that King Arthur All Purpose flour produces a consistent pie crust and evenly textured cake crumb. Available at Whole Foods, Smart & Final, and finer grocers around town, the American-grown wheat flour can make a decent pizza crust too. But for home cooks with the right kind of oven (read: one that gets above 500 degrees) looking to make vera pizza Napoletana, Caputo’s Tipo ‘00’ flour is the gold standard. Sotto’s Zach Pollack uses it for all of his perfectly spotted pies. Find it at Sorrento Italian Market off Sepulveda in Culver City and online at Amazon.com. WATER | Many seasoned pizza makers, like Anthony Carron at 800 Degrees, use filtered L.A. tap water for their pizza dough. The key word here is filtered. As L.A.’s only water sommelier would point out, the pH and mineral content of water alters its taste and compatibility with other foods. Fill a glass up from your tap and smell it. If it smells like a swimming pool, you might want to consider using a bottle from the store. Chef Ori Menashe has put Noel Brohner in charge of the pizza at Bestia, and the two like the taste and consistency of Arrowhead bottled water. YEAST | Dry yeast is easy to find, but you might want to start with fresh yeast for a project like this. Surfas Culinary District in Culver City carries fresh one pound blocks in the store’s refrigerated section. Fresh yeast tends to be very perishable, so be sure to call ahead and make sure the store has it in stock. If using dry yeast (some bakers say it’s more consistent than live yeast), be sure to avoid the packets of “active” dry yeast—they require that you start with warm water, which is not always something you want to do when making pizza dough—and just go for the one labeled instant. Keep it refrigerated until you’re ready to use it. SALT | Leave that boring canister of iodized salt on the shelf. When you’re dealing with a dish that has less than a dozen ingredients, you want to use the best. Sea salt is a good bet here, though Bestia uses kosher salt (“it has the same weight by volume as sea salt, and blends into the dough more evenly.”). Spice Station in Silver Lake has a number of interesting blends, but you can pick up a basic brand at your nearest grocery store too. TOMATOES | Any nonna worth her sauce has a favorite brand of canned tomato. If you’re like us and aren’t up for canning your own Southern Californian tomatoes (though some growers say they can be sweeter than the ones grown around Mount Vesuvius), consider these often mentioned Italian brands: Cento, Pastene, or San Marzano (white label). Bay Cities Deli in Santa Monica has the widest selection of Italian canned tomatoes in town. If you’re more interested in going organic, Muir Glen, available at Whole Foods, is a good option. 800 Degrees and Terroni both offer their own label of Italian grown tomatoes. GARLIC | Pizza sauces vary from baker to baker—some are cooked, some are used raw before baking—but almost all of the ones we’ve tasted contain garlic. California white garlic is fine, but why not try out some of the Italian varieties that Windrose Farm sells at Santa Monica’s famous Farmers Market? The pretty purple Viola from Tuscany has a mild floral flavor. CHEESE | After you’ve mastered a good crust and sauce, pizza Napoletana begs for the right kind of cheese, a cheese that melts but doesn’t bubble too much, one that is neither watery nor rubbery. Norbert Wabnig at The Cheese Store of Beverly Hills favors mozzarella di bufala on his pizza. He sells two Italian brands at his shop: Regina Bianca and Rusticone. For a more classic pizza, nearly every decent cheese shop in town sells Gioia, a brand made by hand in South El Monte. You can find it at Andrew’s Cheese Shop on Montana, Artisan Cheese Gallery in Studio City, and The Cheese Store of Pasadena. BASIL | Nancy Silverton at Pizzeria Mozza uses organic baby basil on her pizza Margherita. For fresh basil, turn to Tutti Frutti Farms (they show up at the bigger markets around town, including the Sunday Hollywood Farmers’ Market). At their green stall, find a number of different basil varieties depending on the season. Smell each bunch to get a sense of the herb’s pungency. OLIVE OIL | There are a dizzying array of brands out there, so just know this: finding one that fits your personal taste preferences is important. Plenty of stores, from Williams-Sonoma to The Cheese Store of Silver Lake offer olive oil tasting bars. When you find one that hits the fruity and spicy notes you prefer, stick to it. West Hollywood’s swanky Fig & Olive carries a few fine French and Italian olive oils. The Oaks Gourmet in Hollywood has a wide selection of oils from all over the world.